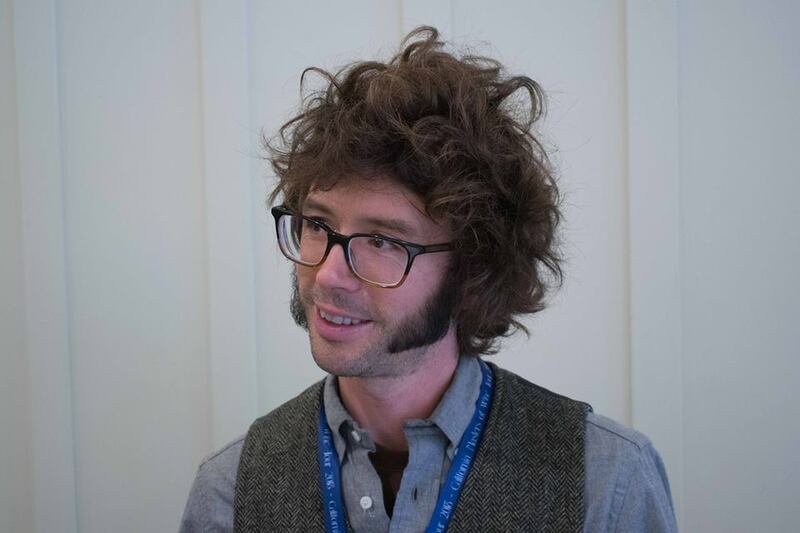 The Screaming Eagle tasting, presented by Mary Margaret McCamic MW and winemaker Nick Gislason (pictured below), signified a lot of things to me. To begin with, it was incredibly generous to be offered such a thorough tasting; one which took place for the first time in public and gave us a glimpse of the goings on behind the scenes of a legendary wine. We were fortunate enough to taste 8 different components of the blends which make up both the Screaming Eagle and the Flight; the latter is a Merlot based wine. It was also a brave act, as wines, which have acquired a cult status and sell at an average price of more than 3.000 euros, were presented to almost 50 Masters of Wine from all over the world. I have been to tastings with other cult wines, and both I and other colleagues found ourselves being critical of some of these highly acclaimed wines, as they displayed power without finesse. They were rather one dimensional, instead of being layered. Would that be the case with the Screaming Eagle, as well? That is the thought that crossed my mind as the wines were served. First released in 1995, the Screaming Eagle continues to command high prices at auctions. New releases of the wine quickly double on resale – it has been estimated that at least a third of Screaming Eagle’s mailing list customers immediately “flip” their bottles on the secondary market. The initial price, for everyone, is 1050 USD says Mary Margaret. As Mary Margaret and Nick started unfolding the puzzle we learnt that Screaming Eagle is a single vineyard of 48 acres (19.4 ha) split into 2 blocks. Two red wines are produced, Screaming Eagle, which is Cabernet Sauvignon based and The Flight which is Merlot based (usually 55-70% Merlot). The Flight was first released in 2006 and was originally named ‘Second Flight’, but the winery changed this name because it felt that keeping the word ‘second’ on the label didn’t do the wine justice. Three types of soil can be found on their land, the most important of which are the volcanic and gravel soils. Margaret and Nick highlight the importance of soils. “Soil mapping starts with the use of photography. After the harvest, depending on the ripeness of the grapes, you realise there are differences in the crop you harvest, which gives you an idea of where to look for soil variations, you then dig to 10ft (about 3m), take pictures of the vertical section showing the stratification of the soil and try to build the Screaming Eagle map”. The vineyard is 50% dry farmed and is divided into 50 parcels, which are managed individually according to the trellis system, cover crops, harvest time, use of animal says Nick Gislason. It has been planted since the 40’s and included even Riesling at one time; it was replanted in the 80's and underwent major replanting in 2006. It consists of 60% Cabernet Sauvignon, which is balanced by plantings of Cabernet Franc and Merlot. * The Trip to California was orginized by the California Wine Institute and the Institute of Masters of Wine. The tasting kicked off with servings of 3 potential components of The Flight. The first comes from the eastern part of the vineyard with gravelly, iron rich soil. It delivers ripe strawberry and floral notes, it is fleshy and big, but is not a blockbuster. It is impressively polished, with bright acidity, which gives it freshness and vibrancy. The second wine is from darker gravel with silica, which produces very small berries. It is more restrained, with a vertical structure. More Bordeaux like, if you prefer, providing the base for the wine, to which it will offer balance. The last wine comes from rich loamy soils, further east, and is floral and spicy. An intense wine, which provides a power component, although most of the time it does not make it into the Flight. As we move on to the Cabernet Sauvignon components, I find that I am already impressed by the Merlot wines, which delivered purity of fruit, delicacy and vibrancy. 4 Cabernet wines are served, mostly from clones 6 and 7, together with a Cabernet Franc. The first two, which come from iron rich soils on the east side, are rather elegant, whereas the others, from the western side, are more structured, meaty and big. And then The Flight 2016 and the Screaming Eagle were revealed. The Flight is my favourite. The blend is constituted by 15-18 blending components (the same holds for the SE) and it delivers a floral and crunchy red fruit character, with moderate oak influence. On the palate the wine is peppery, energetic, with tannins fit for a seminar. An amazing wine, super long, with an aromatic lift. Eventually it is time to taste the Screaming Eagle, which has an almost purple appearance, with an exotic, intoxicating nose, which highlights the many aromatic layers. Spices, mint, cassis, tobacco. It is big, with 14.8% abv, but the overall impression is that of power and grace. I have to say that like many other MWs I was expecting a bigger, sweeter wine, but was pleasantly surprised and delighted by its focus, purity and complexity. The tasting was a revelation, by all means. Why is Screaming Eagle different, one may ask, and that question was certainly posed. Nick supports the idea that air flow in the canopy promotes acidity and brightness, thus the vines hold acidity, and combine opulence and finesse. Mary discusses the shift in style with Nick. “While there was always a true sense of place with the Screaming Eagle, Nick went for more freshness and femininity I think.” The artistic personality of winemaker Nick Gislason has played a major role, for sure. 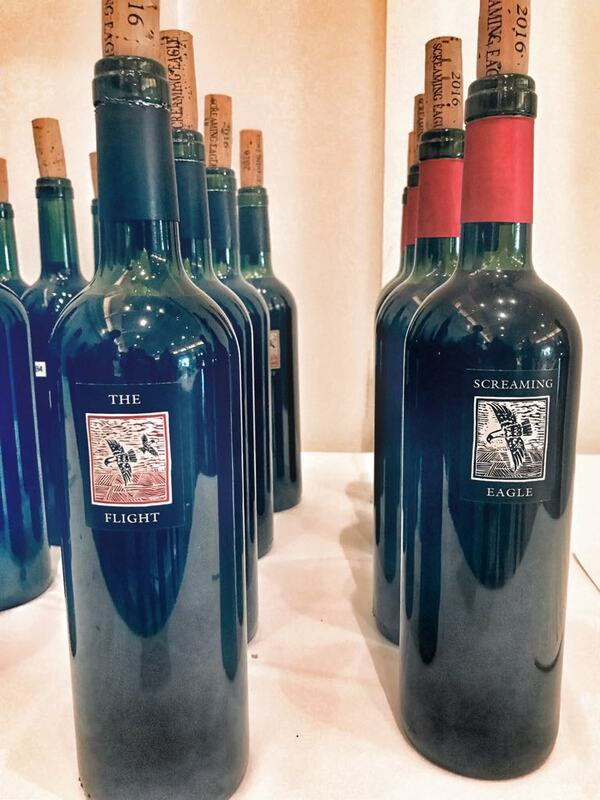 The Screaming Eagle is the most iconic wine of the United States. It defines the ultimate, “cult”, Californian wine, and stands tall among the world’s most sought after bottlings. Its reputation, and often price, is similar to those of Pétrus and Domaine de la Romanée-Conti. With a production of 500-850 cases per label, depending on the vintage, it has a solid following and is distributed mainly to collectors, but also to restaurants, under a single common price, so this obviously benefits mailing list subscribers. Tasting the wine confirmed the legend and its worth.